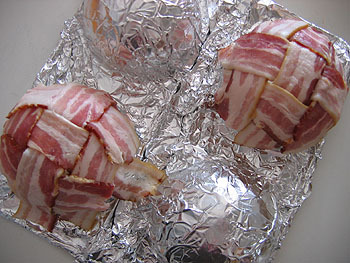 When it comes to party appetizers, pigs in a blanket are yesterday’s news. 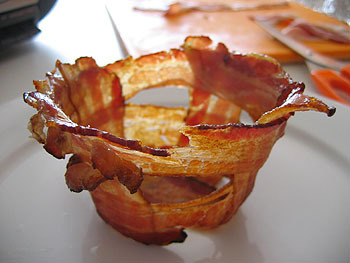 If you really want to wow your guests, we have two words for you: bacon cups. 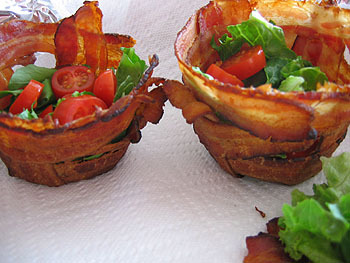 Make sure you have lunch before you check out home project weblog Not Martha’s post on how to make these knock-your-socks-off bacon cups, because you will get hungry. 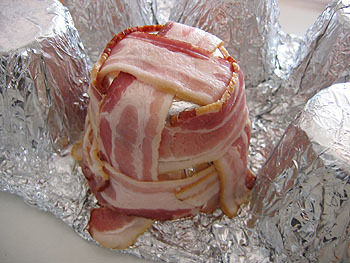 The author experimented with different ways to weave mini bacon baskets together and plop them on the bottom of a foil-lined muffin tin to hold their shape in the oven. I set the oven at 400 degrees and carefully formed foil over the back of the muffin pan. 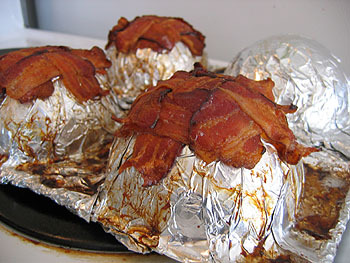 I did not coat with cooking spray, it would have been easier to remove but I suspect that the bacon would not have held the form as well if the foil was oiled and would have popped apart half way through cooking. 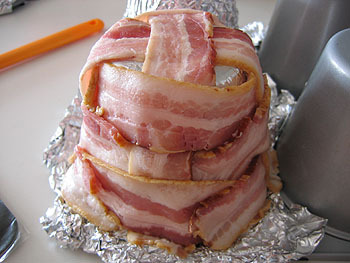 On the other hand some bacon did break when I was peeling away the foil. 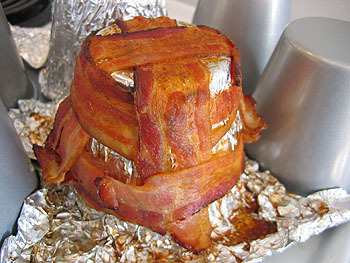 I cooked the bacon, moving the pans around, until it was crisp looking and waited for it to cool before removing the foil and shaped bacon. For cup shapes I used the back of this Wilton King-Size Muffin Pan. These are the width of jumbo muffins but are almost twice as tall (see this cupcake for a visual). 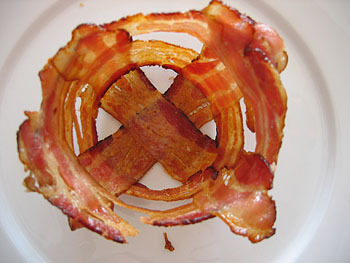 For as floppy as the bacon is when trying to weave it, it keeps its shape really well once cooked to the point that it is crisp. I also tried to make small round bowls using the back of a Betty Crocker mini filled cake pan. 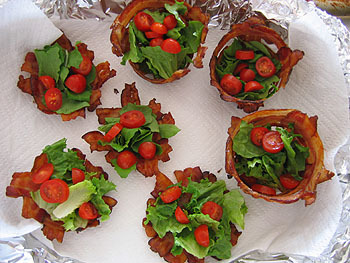 Going for a breadless BLT I filled the cups with lettuce (the arugula was the best) and sliced cherry tomato. After some serious investigation it was determined that the shallow bowls were the easiest to eat as finger food, while the cups were dramatic. 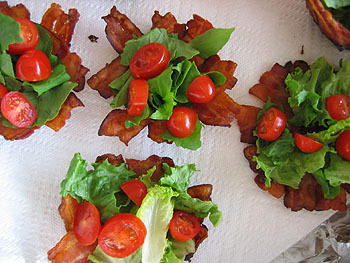 I had hoped to make a mayo-based salad dressing to really fill out my the BLT theme but I completely ran out of time. Overall, a success!